*My first name is pronounced Migel, with a silent 'u'. Following the Spanish naming conventions, I have two last names: Escobar Varela. Either or both can be used in formal situations. I am a web developer, translator and theatre researcher who has lived in Mexico, The Netherlands, Singapore and Indonesia. I work as Assistant Professor of Theatre Studies at the National University of Singapore and Academic Advisor on Digital Scholarship at the NUS Libraries. I also direct the Contemporary Wayang Archive and convene Digital Humanities Singapore. My main research interests are Indonesian theatre and digital humanities. If you want to get in touch, please drop me a line: m [dot] escobar [at] nus [dot] edu [dot] sg or follow me @migueljogja. Code and data for my projects is available on GitHub @villaorlado. The Contemporary Wayang Archive (CWA) is a digital archive of new versions of Java's oldest performance tradition: wayang kulit. This archive includes full-length video recordings, performance data, translations, and notes by the editors and translators of how the performances were received in their original context. The Interactive Wayang Screen (with Daniel Sim) is a Tangible User Interface for the Contemporary Wayang Archive that uses traditional components of the Javanese wayang kulit puppet theatre and Arduino sensors. It received the award for Best Contribution to Creative Communication by ACM Creativity and Cognition 2017. 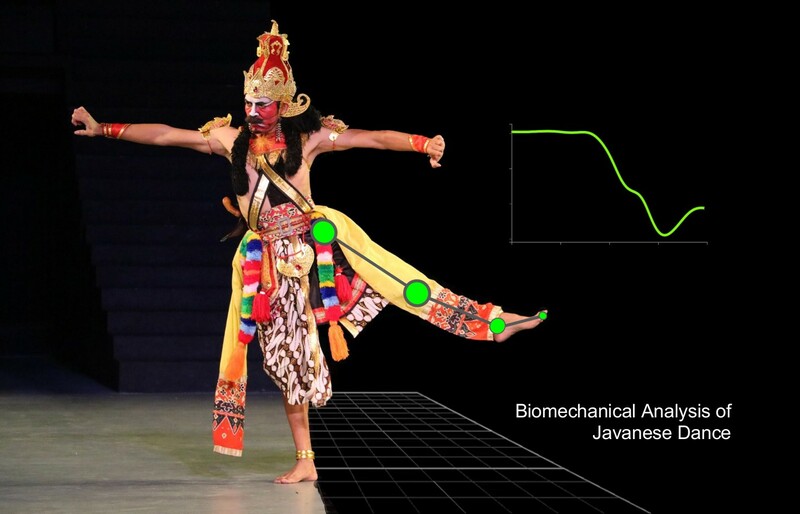 The Biomechanical analysis of Javanese dance (with Luis Hernández Barraza) is a portal that uses biomechanical measurements (such as range of motion) to analyze differences among character types in Javanese dance. Character typology is a central concept in Javanese dance discourse and this project aims to bring together a biomechanical analytical toolkit and Javanese intellectual traditions of dance scholarship. 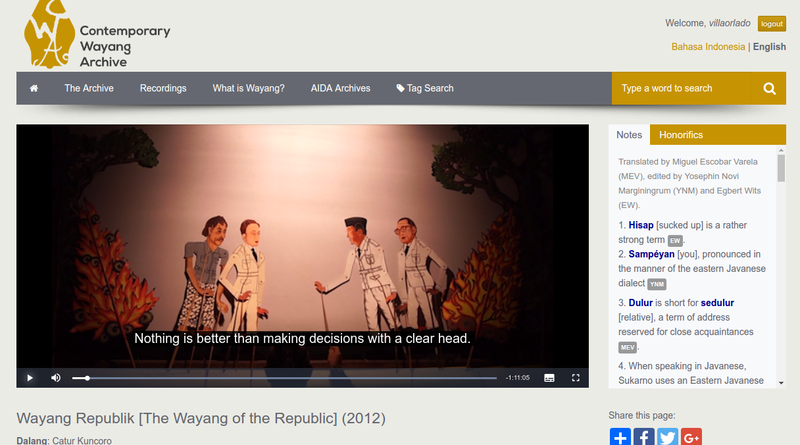 The Digital Wayang Encyclopedia is a data-driven online dictionary of the main characters and storylines of Javanese wayang kulit theatre. 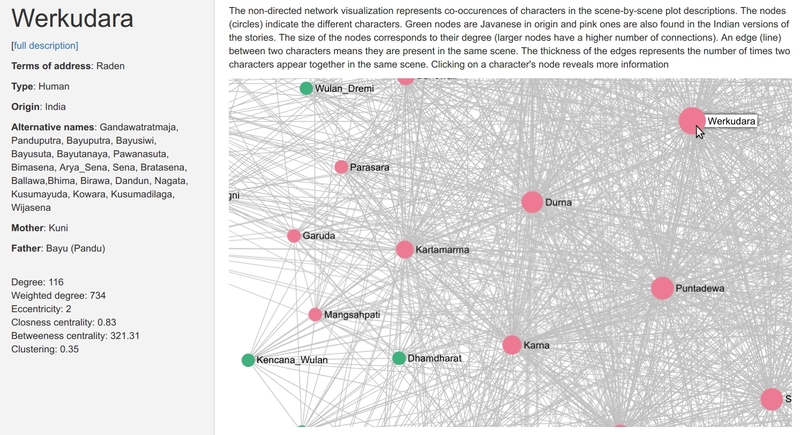 It includes network visualizations and quantitative analyses of character relations. M. Escobar Varela. 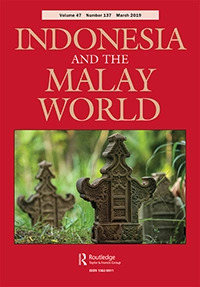 'Towards a digital, data-driven wayang kulit encyclopedia: histories, experiments and epistemological reflections' in Indonesia and the Malay World Vol. 47, Issue 137 (2019). 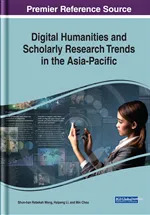 M. Escobar Varela, M. Stanley-Baker and A. Nanetti 'The Digital Humanities in Singapore' in R. Wong, H. Li and M Chou (eds), Digital Humanities and Scholarly Research Trends in the Asia-Pacific Hershey, Pennsylvania: IGI Global (2019). M. Escobar Varela and L. Hernández-Barraza. 'Digital Dance Scholarship: Biomechanics and culturally-situated dance analysis' in Digital Scholarship in the Humanities (2019). M. Escobar Varela. 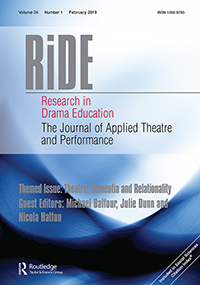 'The dramaturgy of theatre fieldtrips: studying cultural relativism in situ' in Research in Drama Education: The Journal of Applied Theatre and Performance (2019). M. Escobar Varela. 'What is an intercultural exchange?' in M. Bleeker, H. Roms, A. Kear, & J. Kelleher (eds. 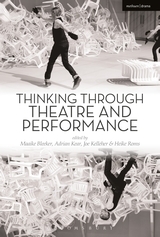 ), Thinking Through Theatre and Performance. London: Methuen Bloomsbury (2019). A. Schauf and M. Escobar Varela. 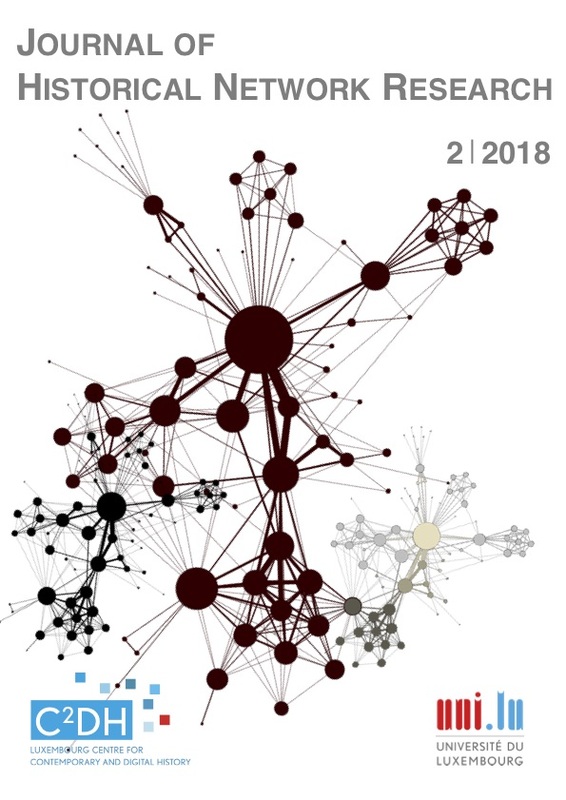 'Searching for hidden bridges in co-occurrence networks from Javanese wayang kulit' in Journal of Historical Network Research Vol. 2, No 1 (2018), pp. 26-52. M. Escobar Varela and Nala H. Lee. 'Language documentation: a reference point for theatre and performance archives?' 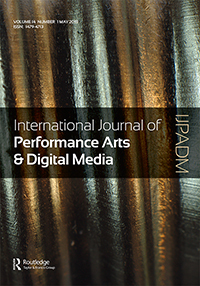 in International Journal of Performance Arts and Digital Media Vol. 14, No 1 (2018), pp. 17-33. M. Escobar Varela and Gea Oswah Fatah Parikesit. 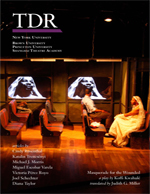 'A Quantitative Close Analysis of a Theatre Video Recording' in Digital Scholarship in the Humanities Vol. 32, No 2 (2017), pp. 276-283. M. Escobar Varela. 'From Copper-Plate Inscriptions to Interactive Websites: Documenting Javanese Wayang Theatre' in Toni Sant (ed) Documenting Performance: The Context and Processes of Digital Curation and Archiving (London; New York: Bloomsbury Publishing, 2017), pp. 203–14. M. Escobar Varela. 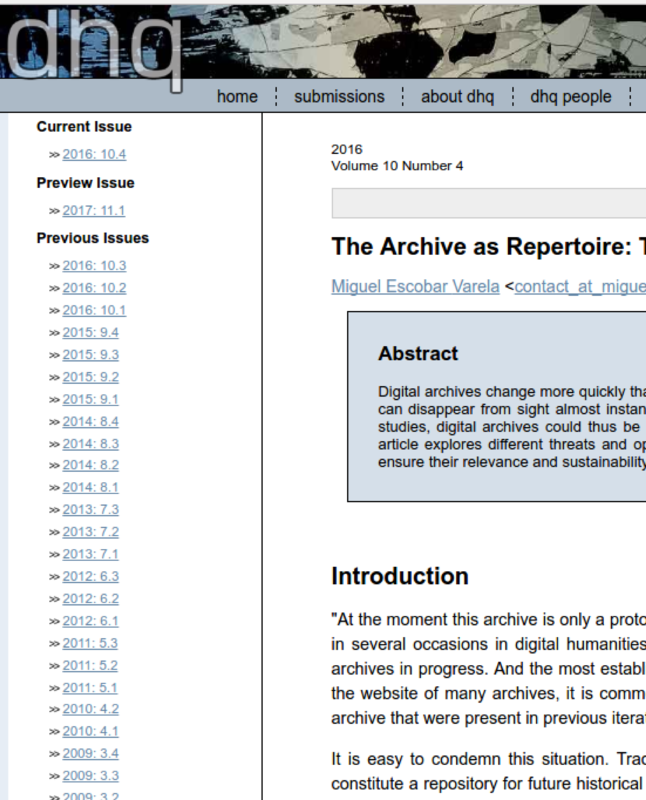 'The Archive as Repertoire: Transience and Sustainability in Digital Archives', in Digital Humanities Quarterly, Vol. 10, No. 4 (2016). M. Escobar Varela. 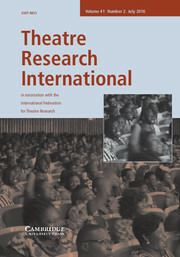 'Heirlooms of the Everyday: The Material Performances of Slamet Gundono' in Theatre Research International, Vol. 41 No. 1 (2016), pp. 53-69. M. Escobar Varela. 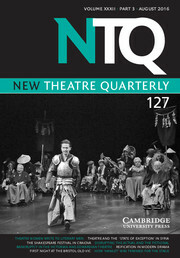 'Hacking and Rehearsing, Experiments in Creative Tinkering' in New Theatre Quarterly, Vol. 32, No. 01 (2016), pp. 68-77. M. Escobar Varela. 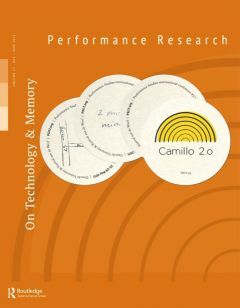 'Interoperable Performance Research: Promises and Perils of the Semantic Web' in TDR, Vol. 60, No. 3 (2016), pp. 136-147. M. Escobar Varela. 'The essay/ontology workflow, challenges in combining formal and interpretive methods' in Digital Scholarship in the Humanities, Vol. 31, No. 1 (2016), pp. 84-94. M. Escobar Varela. 'Wayang Hip Hop: Java's Oldest Performance Tradition Meets Global Youth Culture' in Asian Theatre Journal, Vol. 31, No. 2 (2014), pp. 481-504. M. Escobar Varela and Paul Rae. 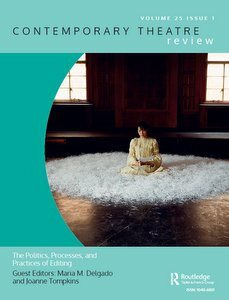 'International, A Dialogue' in Contemporary Theatre Review, Special Issue: The Politics, Processes and Practices of Editing, Vol. 25, Issue 1 (2015). M. Escobar Varela. 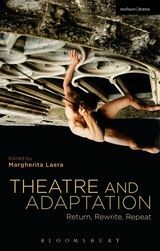 'Between Radical Adaptation and Strategic Adaptability: Ki Catur "Benyek" Kuncoro in Conversation with Miguel Escobar' in Margherita Laera (ed), Theatre and Adaptation: Return, Rewrite, Repeat (London: Methuen, 2014). M. Escobar Varela. 'The Intermedial Interrogation of Memory' in Performance Research, Vol. 17, Issue 3 (2012), pp. 33-38. M. Escobar Varela. 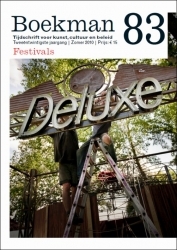 'Nieuwe-mediafestivals als Voedingsbodem voor Diversiteit' [New Media Festivals as Seedbeds for Diversity] in Boekman Tijdsdschrrft, Vol. 83 (2010), pp. 88-92. M. Escobar Varela. 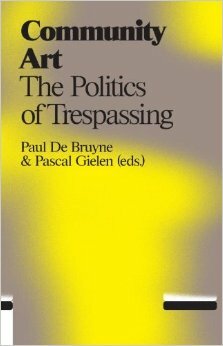 'Ruang Rupa: Experimental Video Workshops and Activism in Indonesia' in Paul de Buryne and Pascal Gielen (eds), Community Art: The Politics of Trespassing (Amsterdam: Valiz, 2010), pp. 287-298. Network Analysis Shows Previously Unreported Features Of Javanese Traditional Theatre, Digital Humanities 2018 Bridges/Puentes, Universidad Nacional Autónoma de México and El Colegio de México, 25-29 June 2018. Slides. Augmented dance scholarship: computer assisted analysis of Javanese dance (with Luis Hernández-Barraza), Digital Humanities 2017 Access/Accès, McGill University and the Université de Montréal, 8-11 August, 2017. Slides. 'The Contemporary Wayang Archive: Javanese Theater as Data', Digital Humanities Abu Dhabi, New York University Abu Dhabi, United Arab Emirates, April 10-12, 2017. 'The DH Scholar as an Intermediary: Connecting Physics and Theatre Scholarship', Digital Humanities and Digial Archives 2016, National Taiwan University, Taipei, Taiwan, December 1-3, 2016. Luis Hernandez, Chen-Hua Yeow and Miguel Escobar Varela. 'A Biomechanical analysis of traditional javanese dance styles' 16th International Conference on Biomedical Engineering, National University of Singapore, Singapore, December 4-7, 2016. 'The Mouse-Deer and the Captured Princess: The Reinterpretation of Javanese Literary Characters in Ecological Theatre Performances', ASLE-ASEAN: Global in the Local, National Univesrity of Singapore, Singapore, August 1-2, 2016. 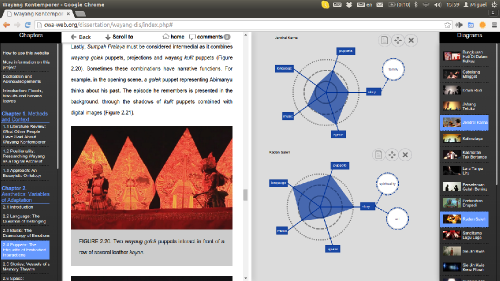 'Arduino Circuits and Javanese Puppets: Re-materializing Digital Archives through Tangible Interfaces', Digital Humanities 2016, Jagiellonian University, Krakow, Poland, 11-16 July, 2016. 'Circuits and Puppets: Re-materializing Digital Archives through Tangible Interfaces', International Federation for Theatre Research 2016 Presenting the Theatrical Past, Stockholm University, Stockholm, Sweden, June 13-17, 2016. 'Digital Archives and Digital Methods: An Indonesian Case Study', International Conference on Asian Digital Libraries, Yonsei University, Seoul, Korea, December 9-12, 2015. 'Non-hegemonic Interoperability: Towards a Global Conversation in Digital Performance Research' DH2015 Global Digital Humanities, University of Western Sydney, Australia, June 29 - July 3, 2015. 'The Archive as Repertoire' at Digital Densities, Digital Humanities Incubator, University of Melbourne, Australia, March 2015. 'Digital Essays as Tools For Cultural Mediation' at DHA14: Digital Humanities Australasia, University of Western Australia, Perth, Australia, March 2014. 'The Contemporary Wayang Archive: A Digital Inquiry into the Ethics and Aesthetics of a Theatre Tradition', poster presentation, at the 3rd Annual Meeting of the Japanese Association for Digital Humanities, Ritsumeikan University, Kyoto, Japan, September 2013. 'Wayang Hip Hop: Java's Oldest Tradition Meets Global Youth Culture', at Global Encounters in Southeast Asian Performing Arts, Bangkok University, Bangkok, Thailand, February 2013. 'Intermediality in Wayang Kulit', at PSi Performance Studies international #17 - Camillo 2.0, Utrecht, The Netherlands, May 2011. I am often a guest performer/rapper with Wayang Hip Hop in Indonesia (Second from left in the image). I was a performer in The Mountain (dir. 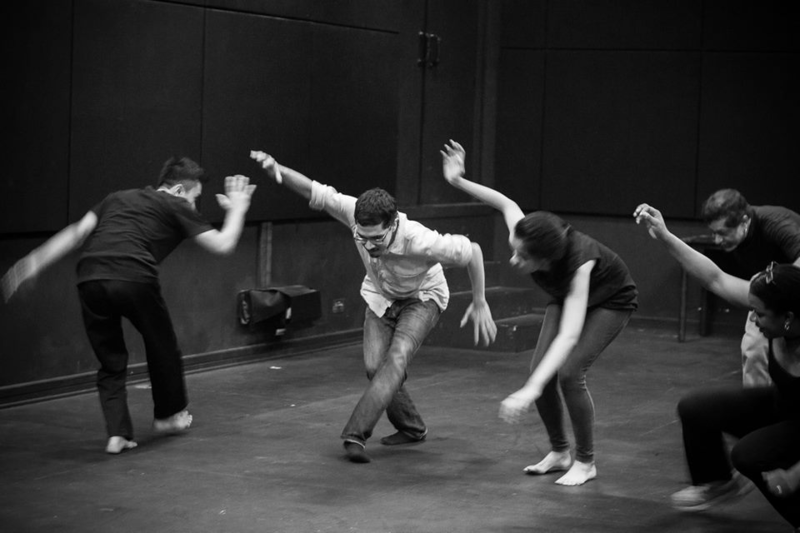 Felipe Cervera), in the 2014 M1 Singapore Fringe Festival: Art and the People (Second from left in the image).